The museum is open Wednesdays and Saturdays 1 – 6 pm. Grimshaw died in 2014 at age 67. At the exhibit, you’ll find Grimshaw’s desk, his drawing board, numerous personal items and books, even a sweatshirt with his name on it, as if the studio was still inside his home. His widow and the exhibit curator, Laura Grimshaw, told WON.com that she had always wanted to commemorate her husband and his work. “The studio was always the main thing, whenever we would move somewhere (the couple lived extensively in California and Michigan) the first thing we would do is we would map out where his studio was going to go…it was the most important feature of his home,” she says. Grimshaw caught the poster bug while still in the Navy during the Vietnam War. 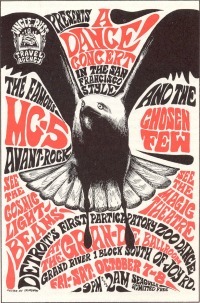 Based in San Francisco he saw some of the early poster art for the famed Fillmore ballroom and was fascinated by it. As a child, he’d always “doodled” in art, Laura aid. When Detroit concert producer Russ Gibb started the Grande Ballroom, he hired Grimshaw to create the posters. These are legendary, and were done as advertisements for all manner of bands – international and local – who played the iconic ballroom, which operated from 1969 - 1972. He also contributed to many underground newspapers of the era, such as Detroit’s Fifth Estate and the San Francisco Oracle. Grimshaw grew up with members of the MC 5 and was essentially their house artist. When the MC 5 teamed with radical poet John Sinclair, who formed the White Panther party, Grimshaw did the political art. Perhaps his most famous poster was that for a Free John Sinclair rally in 1971 at Ann Arbor’s Crisler Arena, headlined by acts like John Lennon, Yoko Ono and Stevie Wonder. Laura Grimshaw described her husband as “the visual” for all the political activism of the period. In 2012, along with well-known photographer Leni Sinclair (married to John Sinclair), he created the book, Detroit Rocks! A Pictorial History of Motor City Rock and Roll 1965-1975.